Zika virus has been detected in dead monkeys found in Brazil near São José do Rio Preto, São Paulo State, and Belo Horizonte, Minas Gerais. The animals had been shot or beaten to death by locals who thought they had yellow fever. In fact, the monkeys were bearers of Zika virus, which had made them sick and more vulnerable to attack by humans. "The discovery shows the potential exists for Zika to establish a sylvatic transmission cycle [involving wild animals] in Brazil, as already occurs in the case of yellow fever. If the wild cycle is confirmed, it completely changes the epidemiology of Zika because it means there's a natural reservoir from which the virus can reinfect the human population much more frequently," said Maurício Lacerda Nogueira, principal investigator for the study. Nogueira is a professor at São José do Rio Preto Medical School (FAMERP) and chairs the Brazilian Society for Virology (SBV). Zika virus was detected in monkeys accustomed to the presence of humans in the state of Ceará some years ago, but this is the first detection in the wild since the ongoing epidemic began. An article on the study signed by Nogueira and researchers affiliated with several other institutions has just been published in Scientific Reports. "During the yellow fever epidemic, we realized there were many dead monkeys, killed not by the disease but by people who were afraid of contagion. The monkeys had been shot, cudgeled or bitten to death by dogs. When healthy, these primates—mainly marmosets (Callithrix sp.) and capuchins (Sapajus sp. )—are very hard to capture," Nogueira explained. "So we concluded that if they were being killed relatively easily, it was probably because they were sick, not from yellow fever, which is lethal to monkeys, but from some other disease that didn't kill them but made them weak and vulnerable." 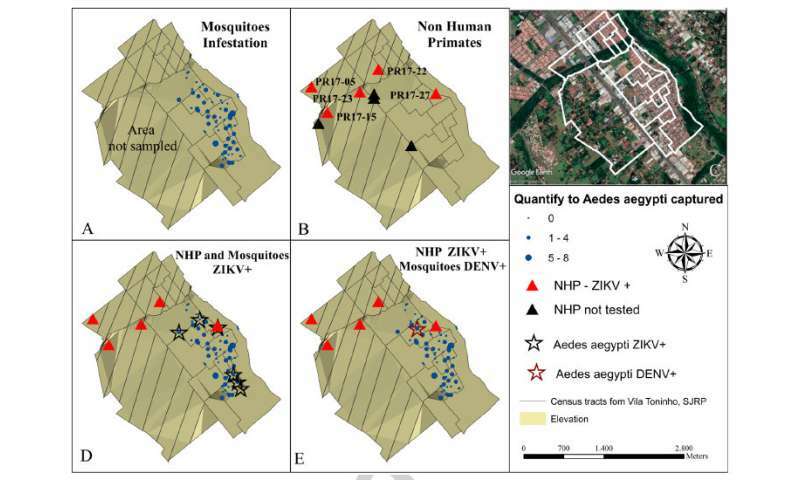 Natural and experimental infection of monkeys with Zika shows these animals can be vertebrate hosts, participating in transmission and circulation of the virus in tropical urban environments. According to the article just published, however, "more studies are necessary to understand the role they may play in maintaining the urban cycle of Zika virus and how they can be a channel for the establishment of an enzootic [nonhuman] transmission cycle in tropical Latin America." "As yellow fever has shown, epizootic diseases [occurring at the same time in many animals in the same geographic area] will always be a source of epidemics among humans, even after a possible control and eradication of the urban transmission cycle through the development of successful countermeasures such as vaccines and antivirals. It's a game changer, and policy makers, public health officials and vaccine developers should take notice," said Nikos Vasilakis, a professor at UTMB's Center for Tropical Diseases and one of the lead authors of the article just published. "Our observations will have important implications in our understanding of the ecology and transmission of Zika in the Americas," Vasilakis said. "Although this is among the first steps in the establishment an enzootic transmission cycle among New World nonhuman primates and arboreal mosquitoes, the implications are enormous, because it is impossible to eradicate this transmission cycle." Vasilakis stressed the importance of the funding for the study received from FAPESP and the US National Institutes of Health (NIH), which "recognized the significance of the subject early on," and supported research that also serves as an example of the "seamless and long-established collaboration between groups at UTMB and FAMERP."